How many would-be authors toil, or plan to, anticipating that "Once my nonfiction book is published, my name and my words will live forever!" 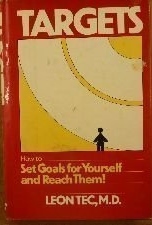 While perusing my Journals from 1981 I found a reference to Targets: How to set goals for yourself and reach them! by Leon Tec. The hardcover (right) was published in 1980 by Harper & Row; a paperback by Signet (below) in 1982. I just checked on Amazon and there was not one single customer review. 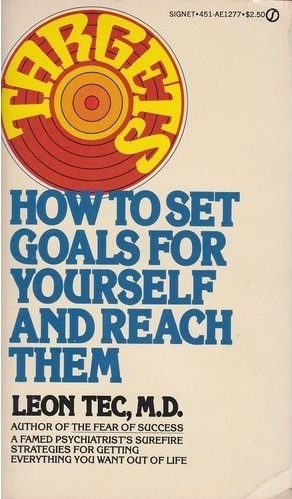 There was a blurb in the listing that said, "Non-fiction - Self-help - Dr. Leon Tec, a psychiatrist, offers suggestions for using short-term goals that add up to a program moving you toward successful completion of complex tasks. Includes chapters entitled: Noticing the Elephant, Determining Targets, A New Look at Planning, How to Get Around to Doing Things You Don't Like, Handling Diversionary Targets, and more." Please do not read this as a discouragement to your writing ambitions - Write on! Write on with reasonable expectations, for the pure joy of sharing your insights and conclusions.